3. With the large rainfall events in June, the lake water level rose enough to allow the dredge temporary access to the remaining areas at O’Brien Shoals that were still under contract to be dredged, but were previously inaccessible due to rocky deposits and shallow water depths. Some additional dredging was accomplished, but it appears, at least for now, that all the dredging feasible at O’Brien Shoals has been completed. 4. The map currently found on the MPOA website (and below) still provides a good APPROXIMATE representation of where the dredge and dredge pipeline is located. 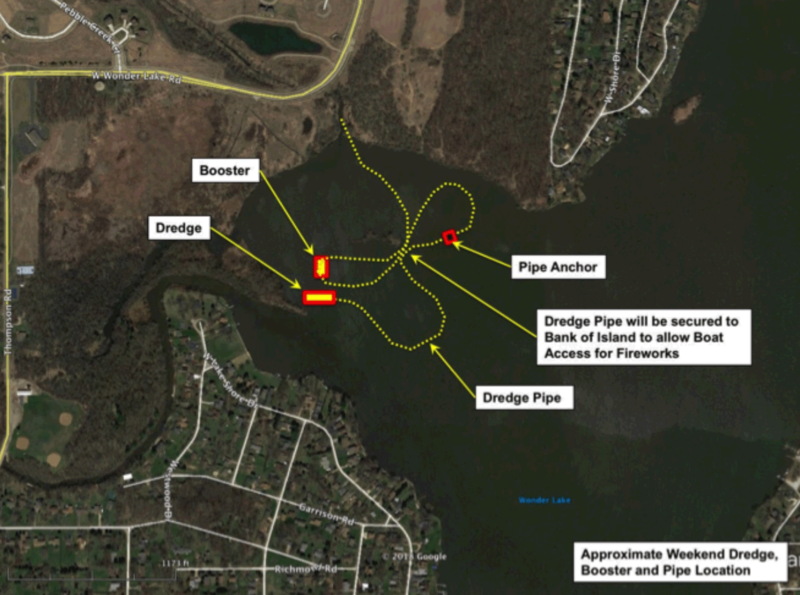 Again, the entire West Bay and adjacent areas should be avoided for the rest of the 2018 boating season, as the location of the dredge and pipeline will frequently change as dredging is competed. Access to the main lake for those landowner’s on the south side of West Bay and the Nippersink Creek inlet may still face temporary short-term inconvenience but the dredge crew will do all they can to facilitate safe passage. 5. As of June 15th, 2018, approximately 87% of the 529,378 cubic yards of sediment under contract to be dredged from Wonder Lake has been completed. 6. On Saturday, July 21st,(mosquitoes permitting) the Nippersink Watershed Association will conduct another workday, clearing invasive brush from a portion of the Merchant Creek stream corridor. This volunteer work is being done in advance of an upcoming IEPA Section 319 funded stream stabilization project to help minimize the significant amounts of sediment that this parcel has delivered to Wonder Lake over the past decades. Meet at 8 am on the north side of Wooded Shores Drive at Pleasant Drive. As always, volunteers are welcome.